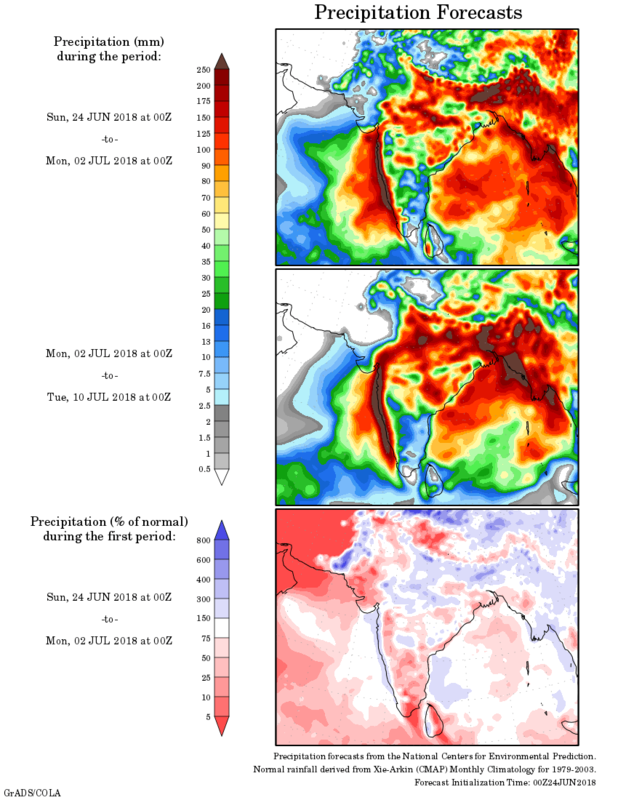 As per IMD :Southwest monsoon has further advanced into some parts of north Arabian Sea, Saurashtra & some more parts of Gujarat region and Maharashtra; some parts of West Madhya Pradesh, some more parts of West Bengal and remaining parts of Assam. The Northern Limit of Monsoon passes through Lat. 21°N/ Long. 60°E, Lat. 21°N/ Long. 65°E, Veraval, Amreli, Ahmedabad, Khandwa, Amravati, Gondia, Titlagarh, Cuttack, Midnapore, Lat. 24°N/ Long. 89°E, Jalpaiguri and Lat. 27°N/ Long. 87°E. Conditions are becoming favourable for further advance of Southwest Monsoon into some more parts of north Arabian Sea, Gujarat State; remaining parts of Maharashtra; some more parts of Madhya Pradesh, Chhattisgarh,; remaining parts of Odisha, West Bengal and some parts of Jharkhand and Bihar during next 48 hours. Conditions are likely to become favourable for further advance of Southwest Monsoon into some more parts of north Arabian Sea, remaining parts of Madhya Pradesh, Chhattisgarh and some parts of Uttar Pradesh during subsequent 48 hours. Pre­-monsoon thunderstorm activity is very likely to commence over parts of northwest India from 27 June. એક યુએસી 700 hPa ઉપર છે દક્ષિણ ગુજરાત અને નોર્થ કોંકણ અને લાગુ લાગુ અરબી સમુદ્ર ઉપર. ઇસ્ટ વેસ્ટ શિયર ઝોન છે 20N લેટીટ્યુડ ઉપર જે મહારાષ્ટ્ર/એમપી, સૌરાષ્ટ્ર/ગુજરાત અને અરબી સમુદ્ર માં સામ સામા પવનો નું સર્કુલેસન છે. વાતાવરણ 22 જૂન થી સુધારો જોવા મળેલ છે. ચોમાસુ આજે 24 જૂન ના સૌરાષ્ટ્ર ના દક્ષિણ કાંઠા ના વિસ્તાર વેરાવળ થી લઇ ને અમરેલી થી અમદાવાદ સુધી પહોંચ્યું. હવે 2-3 દિવસ માં સૌરાષ્ટ્ર ના વધુ ભાગો માં આગળ ચાલે તેવી શક્યતા છે. ચોમાસુ ગુજરાત બાજુ વધુ આગળ ચાલી ગયું અને પશ્ચિમ સૌરાષ્ટ્ર બાજુ ઓછું ચાલ્યું જે ચોમાસુ રેખા માં સ્પષ્ટ દેખાય છે. હજુ વાવરણ સારું છે. There is a UAC at 700 hPa over South Gujarat & North Konkan & adjoining Arabian Sea. mean sea level. The shear zone covers Maharashtra adjoining M.P. and Arabian sea and Saurashtra/Gujarat. Southwest Monsoon has onset today the 24th June over South Saurashtra, East Saurashtra, South Gujarat, East Gujarat up to Ahmedabad. Varying amounts of rainfall has been reported. The Southwest Monsoon has not moved over Western Saurashtra and has lagged behind Gujarat and East Saurashtra. Conditions are yet favorable for rain.